It's no wonder for any couple who is migrating to a whole new location or a city and is faced with problems in terms of proper settlement of their household appliances to which their memories and emotions are attached with. Even the newly married couple, Avinash Singh and Pratiksha felt the same while re-locating to capital city, Patna. They had to struggle finding professionals who can manage to set their home well with installation of home appliances, T.V. Air conditioning etc. The couple had to encounter un-wanted pains like rude behavior, fake schedule of time and overcharging in some cases. This very need lead Pratiksha & Avinash to set sail their entrepreneurial journey and to start a venture which would eliminate such hassles and pains which most of people encounter in their day today life. 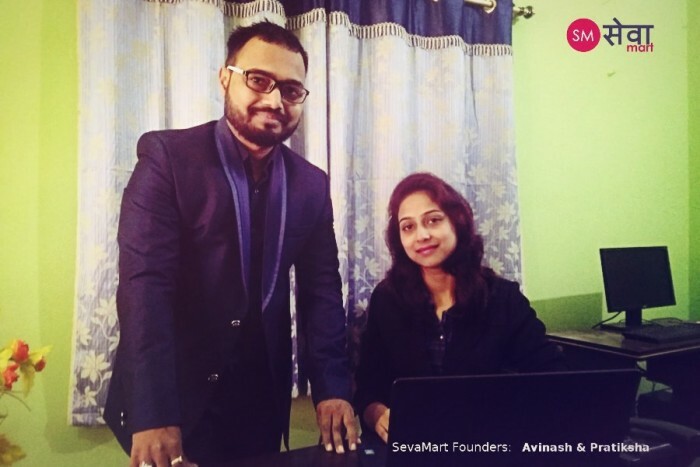 The couple named their venture as SEVAMART. It was founded under company Web Exploration Pvt. Ltd. to offer professional doorstep repair services in Patna. Initially they hired trained technicians having industry experience to deliver repair service in Patna. In the beginning they started taking bookings for AC repair & installation services in Patna and later based on customer feedback added Fridge, Washing Machine and geyser repair services in Patna. Avinash, the Chief operation officer says that people choose SevaMart over others due to the ease with which booking and scheduling of repair and installation services was possible over phone or via online & mobile app. The team offering these services were trained well and also followed standard & transparent pricing models. SevaMart new business model offered free visits regarding estimated costs for the repair after inspection. They didn't charge customers for such preliminary cost estimations. In addition, they offered 15 days warranty on their repair services for free, which was phenomenal. SevaMart has developed it's unique technology and has innovated the way people book appointment, how it's processed, scheduled and services are delivered to the end customers on time without any hurdle. The trained technicians operate via SevaMart's Service Delivery app and their performance are tracked for further quality purposes. SevaMart Started its operations in August 2017 with 1 Team and currently they have 4 teams to cater to AC, Fridge, Washing Machine repairs. They had received 500+ Bookings by the end of 2017. This shows building of trust and brand among the end users. Bootstrapped from scratch, SevaMart reached breakeven by the end of November. Recently They expanded to newer geographies as a part of their expansion plans and have started operations in Muzaffarpur. They are launching SevaMart's services from 1st Feb, 2018. Avinash also envisioned to extend there services across state border and start its operations in Jharkhand in next 2 month. We wish good luck for their expansion programs and all future endeavors. Such businesses are enriching the infrastructural needs of Bihar and is also enriching the startup ecosystem of the state.